Fanfare Vol .1 No 5 Dec. 1940 Presents articles Eat it--strangers! W. Lawrence Hamling 5 Beat it--Hamling Earl Singleton 8 When chaos comes Howard Gott 10 Via jaloppy John W. Hell 15 In tribute Jack Chapman Misko 18 Proposed constitution of the NEFF Art Widner Jr 19 Presidential platformLouis Russell Chauvenet 21 fiction Scarred wrist Donn Brander 17 Regular departments A stranger says editorial 2 Minutes of the stranger club Frederick Weiner 4 Slan_!der Joseph F. Gilbert 11 Strange interlude Eugene O'Neill 22 The last minute Layton U. Sowell 28 Cover Damon Knight 1 Fanfare is published bi-monthly by the Stranger Club of Boston, Mass. Co-editors: Earl Singleton, MIT Grad House, Cambridge and Art Widner Jr, Box 122, Bryansville, Mass.Address all communication to the latter. 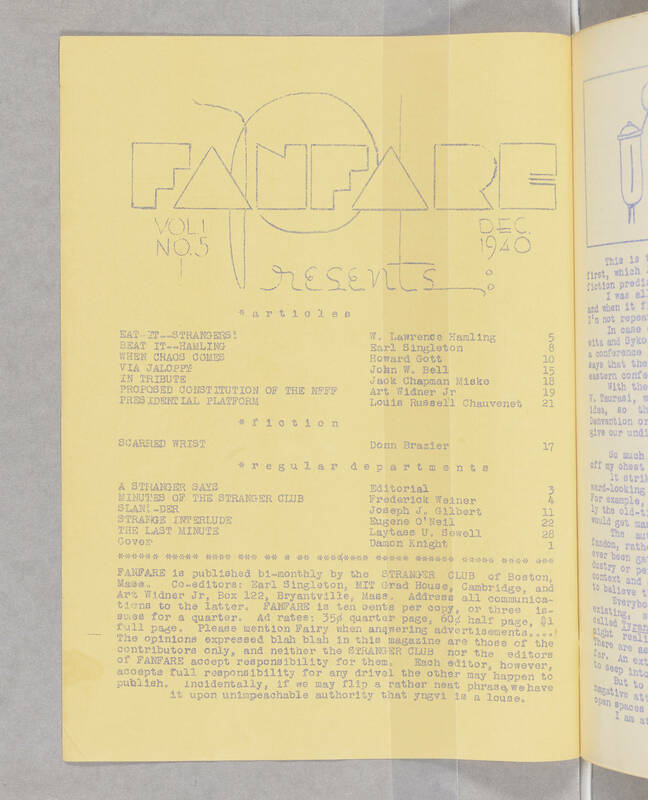 Fanfare is ten cents per copy or three issues for a quarter. Ad rates: 35¢ quarter page, 60¢ half page, $1 full page. Please mention Fairy when answering advertisements....Opinions expressed bah blah in this magazine are those of the contributors only, and neither the Stranger Club nor the editors of Fanfare accept responsibility for them. Each editor, however, accepts full responsibility for any drivel the other may happen to publish, incidentally, if we may flip a rather neat phrase, we have it upon unimpeachable authority that yngvi is a louse.